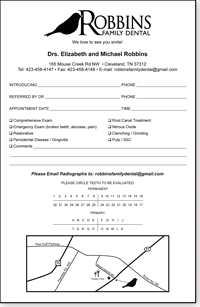 We offer 3 different options for referral pad printing as indicated below. Paper: 20 # Bond with a choice of 11 different paper colors at no extra charge. Padded 25 or 50 sheets per pad. 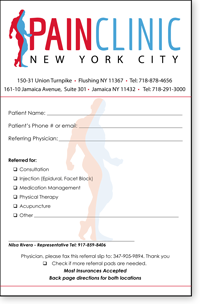 All referrals are completely customized at no extra charge. Any sample in our Gallery can be custom designed according to your specifications including placement of your Logo. 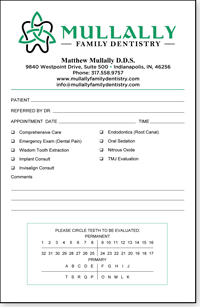 After an order is received, we always provide an e-mailed proof prior to printing. Get all the latest information on Sales and Specials.